I could not figure out the best place to post this, so I figure why not here - Chef, feel free to move if appropriate. I ran across this on the Internet and thought it was kind of cool and an interesting way to appreciate the beauty of the species we chase. This guy takes actual harvested fish and creates a print from the fish using a Japanese technique called Gyotaku. 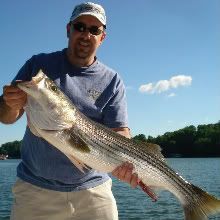 It uses food-safe paints (so that he can still eat the fish when complete with the print), coats the fish and gets an impression on the paper, and then he does some additional overlay painting on the print He lives up in the Northeast and his stripers from the salt out of the MA area. He's also imprinted flounder and other species. For you Facebook fans, there are a lot of other pics of his work and some details of the technique: http://www.facebook.com/pages/Fished-Impressions/286990087523?ref=ts/#! that is excellent work. Beautiful. That is cool looking. Leave it to the japs to slather a dead fish with paint.